Summer has come to our little corner of the woods, but no summer break in the craziness. So when I felt the need for fresh baked goods I had to fall back on good old “just add water” Marie Callender’s Cornbread mix. As a way to sneak some additional veggies into our diet I decided that grated carrots would be a good addition. And since I was getting creative anyhow, I decided to add some grated lemon peel and powdered ginger too. After smelling it in the oven, I was really glad I did. Jim was late for work but stuck around long enough to try some and declare it delicious enough to blog about – so here it is. Just follow the recipe on the package for an 8 x 8 pan and cut the water back to just over a cup for about 1/2 cup of grated carrots and add the rest to taste. 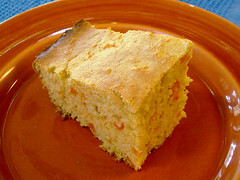 I tried your Made Up Recipe for cornbread today. I queried what I had in the kitchen to make lunch – too rainy and wet to go out. Your orginality sparked mine, so in addition to your added grated carrots and ginger to corn bread mix, I substituted zest of Orange (added the fresh squeezed orange juice for part of the milk, and a drained canned corn, plud trailmix which included various nuts, raisens, dates, coconut; a little cinamon (had expanded on the corn bread mix on hand which said it would make one 8 x 8 cake, 1 cup of whole wheat pancake mix, an extra egg, doubled the amount of grated carrot, and added some oil and honey). It turned out surprisingly good. Thanks for the inspiration. Thanks for the ideas, Julie – that does sound tasty and much fancier than my additions.